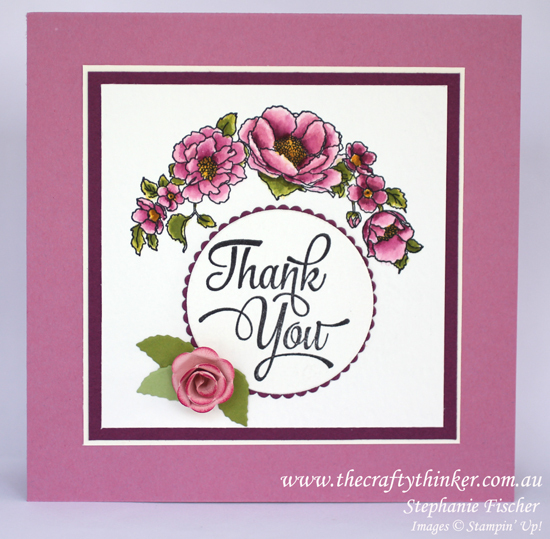 I have entered this card into the Crazy Crafters' Project Highlights this week. To see the other entries and to vote for your favourites, click here. This card is to thank dear friends for including us in a remarkable wedding experience - it stretched over a long weekend and will live in our memory banks forever. The bride loves roses and the curved shape of this image is similar to the one she used for her invitations - so I hope she'll like this. I really love the combination of Sweet Sugarplum and Rich Razzleberry. 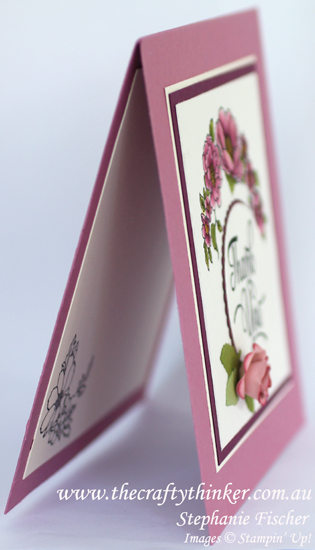 The floral image is from the Timeless Love stamp set. I stamped it onto watercolour paper with Archival Basic Black ink and then watercoloured it with Sweet Sugarplum, Rich Razzleberry, Crushed Curry, Pear Pizzazz and Delightful Dijon. There's also a touch of Gold Wink of Stella in the flower centres. The greeting is from the One Big Meaning stamp set. It is also stamped onto watercolour paper in Basic Black ink then cut out with one of the Layering Circles framelits. I layered this onto a piece of Rich Razzleberry cut with one of the scalloped Layering Circles framelits. The 3D flower is made with the Paisley framelits. You'll find my tutorial here. I left the flowers inside the card unpainted.